The Rotary Club of Cranleigh's plan to create a ‘mile of coins’ on the pavement in Stocklund Square on Saturday, 14 November, was washed out by the weather. It was also decided not to risk assembling a shelter box for health and safety reasons. 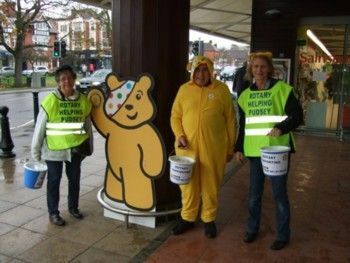 However, undaunted by the rain, the Rotarians resorted to the more traditional method of using collecting buckets to raise funds for Children In Need. As usual, the people passing by were most generous with their donations, and many young children were delighted to receive Pudsey badges or wrist bands. Approximately £688 was raised from the collection, a similar amount to last year.